Mattresses have come a long way from the rudimentary animal hides stuffed with straw, leaves, feathers, horsehair or other loose fillings our early ancestors slept on. Today’s comfortable, technologically advanced sleep systems include mattresses that contain various combinations of coil springs, polyurethane foams, polyester fibers, latex and other manmade and natural materials. Although there is no such thing as one “best” mattress, selecting a mattress from among the number of choices and combinations of materials and technologies can be overwhelming. Innovative new systems and designs are constantly emerging, which makes choosing a mattress that meets the sleeper’s unique needs even more difficult. These technological advancements, however, will help improve sleeper comfort and overall physical and mental well-being. The introduction of coil spring bedding in the early 20th century was perhaps the mattress industry’s most significant leap forward in technology. Based in part on the coil system used in building carriages, these early innerspring mattresses used a series of steel coils covered with wool, natural fibers or soft fabric for padding. Considered state of the art at the time, it wasn’t until the 1980s that polyurethane-filled memory foam mattresses first became available and started to replace innerspring mattresses. Today’s choices also include mattresses made from organic fibers, natural or synthetic latex, gels and hybrid combinations of the various types, although innerspring mattresses continue to lead in sales over other types. Tempur-Pedic is always on the leading edge of technology, and their Supreme Breeze mattress is no exception. The Supreme Breeze’s comfort layer uses Tempur-Pedic’s exclusive PureCool material to extract heat away from the sleeper, which helps maintain a comfortable sleeping temperature throughout the night. The mattress’s TEMPUR-Response filling reacts almost instantaneously to the sleeper’s movements and transfers support to where it’s needed for sound, restful sleeping. Adding a Tempur-Ergo adjustable base with its virtually unlimited sleeping positions, built-in massager and wireless remote control results in the ultimate sleeping comfort and convenience. Perennial mattress industry innovator Beautyrest, who claim to have been the first manufacturer to offer “no flip” mattresses, have introduced SmartMotion™ adjustable bases to complement their line of quality mattresses. Controlled by a wireless remote, the motorized SmartMotion Base features six head and foot massage options and a “snore relief” button that gently raises the head of a snoring partner to open the airways and lessen or alleviate the irritating noise. The SmartMotion Base also includes built-in sleep tracking sensors that independently monitor the heart rate, respiratory rate and nighttime movements of one or two sleepers. Although they may seem like something out of science fiction, some predictions for future innovations in mattresses and sleep technology include a mattress system that self-cleans. As disgusting as it sounds, the average 10-year-old mattress weighs about 30% more than it did at the time it was purchased due to accumulated dead skin, dust mites and miscellaneous debris. Using technology much like today’s vacuum cleaners, mattresses may someday be capable of cleaning themselves. 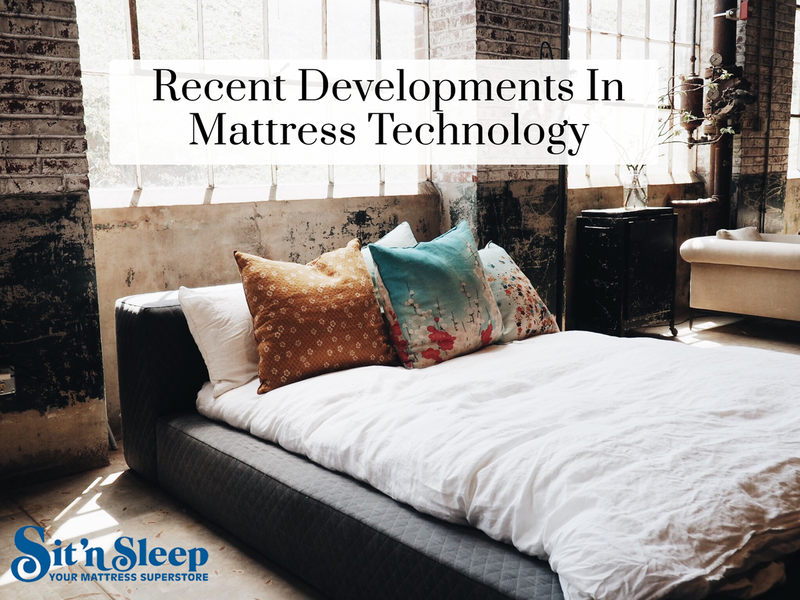 Another expectation is that tomorrow’s mattresses will be equipped with sensors that continuously monitor and control the heat level in the bedroom to keep it at an ideal temperature for sleeping on both hot summer nights and cold winter evenings. The same system could one day potentially change the temperature of the comforter and pillow so that there’s always a cool side. From mattresses and bedframes to linens and accessories, Sit ’n Sleep Mattress Superstores have everything you’ll need to begin sleeping soundly, all at affordable prices. Whatever innovations and advancements in sleeping technology the future holds, you can be sure you’ll find them at Sit ’n Sleep.